This piece was published in The Big Issue in June 2010, and won the runner-up prize at the Refugee Media Week Awards in 2011. Every block holds a hundred distinct histories, but sadly the story of Sighthill also followed a city-wide pattern of social decline. 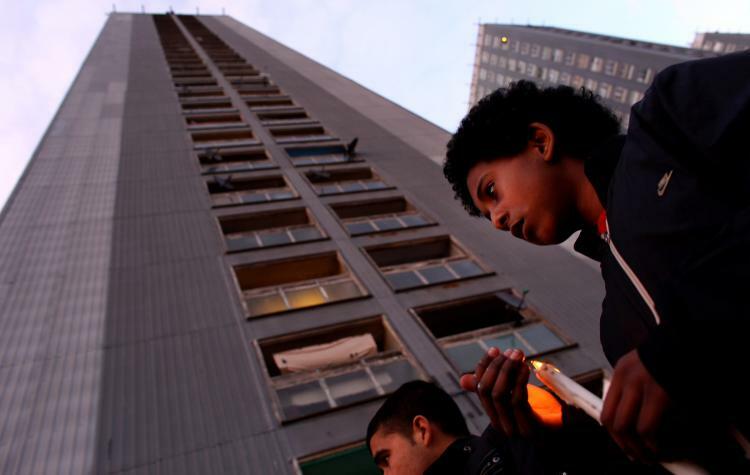 By the 1980s, this high-rise estate – like many others – had become a repository of drugs, unemployment and the petty crime of young men lacking the bright tomorrows promised to Agnes’ generation. Then, in April 2000, the residents of Sighthill were obliged to widen their horizons once again. Glasgow City Council had accepted a contract with an arm of the Home Office to accommodate asylum seekers from unfamiliar corners of the world. Hundreds of newcomers at a time were taken in buses and placed in select schemes where cheap housing stock was available. Lamees Tayyem recalls her family’s daunting arrival in Sighthill in the autumn of 2000. The Palestinian had grown up in a refugee camp in Syria, but Glasgow did not initially feel like somewhere to call home. Her outlook is different today. Sitting in her comfortable three-bedroom flat, Lamees watches BBC News 24’s breaking coverage of the raid by Israeli forces on an aid ship bound for the Gaza Strip. “Terrible, terrible,” she sighs. Lamees at least has somewhere safe to reflect on the fate of her homeland, and has been able to forge a new life for her three children. After being given leave to remain in the UK, she and her husband gained British citizenship in 2007. They have one son at Glasgow University and another set to start next year. She helps out at a project for asylum seekers at St Rollox Church of Scotland – a small brick building transformed into a buzzing charity shop and crèche during the week – and is also involved in Sighthill’s International Women’s Group. Most seem to agree that Sighthill has adapted well to considerable change. Out on his daily patrol, community officer Dario D’Andrea tells me there’s a lot less anti-social behaviour, and enthuses about the football and job training projects he hopes will turn more lives around. He admits, however, that “there’s still a sharp intake of breath when I tell people where I work”. The 2001 murder of Firsat Dag – one of Sighthill’s Turkish asylum seekers – left the area struggling to overcome a reputation for racial intolerance. Many are still bitter about how the media pounced on the idea of native resentment toward foreigners, even though Dag’s killer was not from Sighthill and the murder took place just outside the estate. The Sighthill Community One Stop Shop (SCOSS) – still thriving as a credit union, internet café and host to lots of cross-cultural events – was set up in the aftermath of the murder. “The asylum seekers were dumped here overnight and left to get on with it,” explains Margaret Thomson, a local resident and organiser at SCOSS. Sighthill is quieter these days, partly because there’s not much left. Five of the 10 tower blocks have been demolished in the past couple of years, and Glasgow Housing Association (GHA) plans to tear down three more. Another resident, Tina Suffredini, who works nearby at the Kids and Adults Together in Sighthill centre, says everyone is becoming unsettled by so much uncertainty. A few bus stops away, the Red Road flats face a more definite conclusion. At the end of a sunny day, demolition experts can be seen finishing work at the bottom of one empty tower set to be razed in the autumn. GHA’s repairs were costing more than receipts in rent, so the others will come down over the next seven years. Gilded in an oddly appealing colour scheme of red, grey and beige, the monolithic tower blocks – once the tallest residential blocks of their type in western Europe – have long fascinated academics and film-makers. No doubt more documentaries will be made as the place becomes emptier and eerier. And yet Red Road remains home for the largest concentration of asylum seekers in the city. This evening, many lost in the long, nightmarish battle to have their case fairly assessed by the Home Office are holding a meeting in the estate’s community centre. With the help of Unity – a campaign group working on behalf of those claiming asylum – tonight sees the birth of a union. The Somalis, Eritreans, Afghans and Iraqis air their common fears, mostly in English, and agree to pay £1 in monthly dues to stand together through the bewildering process of removal threats and legal appeals. In her 13th floor flat, Vuyelwa, an asylum seeker from South Africa, explains how grateful she is for the help she has received at Red Road as her Spiderman-mad four-year-old, TT, plasters stickers around the room. “Everyone here knows TT – he’s very popular,” she laughs. But Vuyelwa remains frustrated at remaining stuck in limbo. “Glasgow has lovely people – they tell us where to get things and a lot of love is given, whether you are Christian or Muslim or whatever. I like the city a lot. 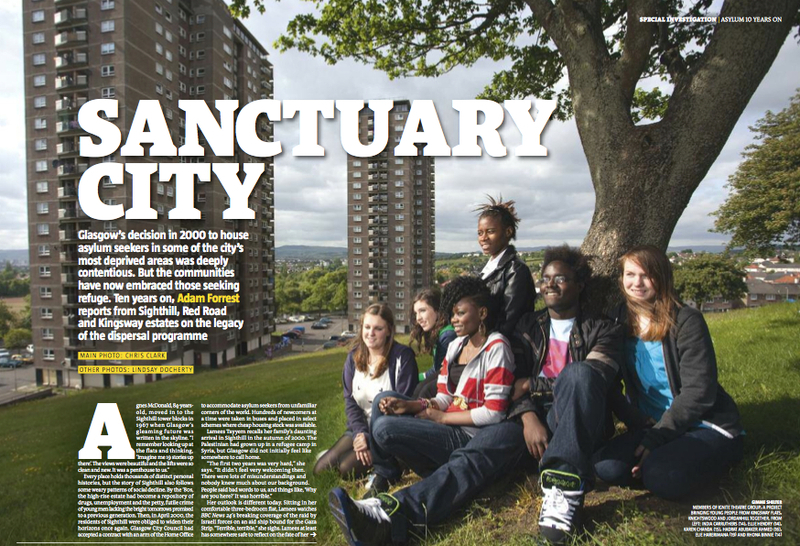 The flats at Red Road are run by YMCA Glasgow, a not-for-profit charity that houses around 1,200 asylum seekers in the city, almost as many as the 1,500 Glasgow City Council provides for. One block at the entrance of the estate, 33 Petershill Drive, provides a starting point for the newest arrivals. There’s a crèche, a women’s group, language classes and friendly concierges who have been through the asylum process and are happily settled in Glasgow after gaining refugee status. The facilities did not prevent the charity facing a storm of criticism a few months ago, following the deaths of a Russian family who jumped 15 floors from another YMCA flat one block over. Joe Connolly, chief executive of YMCA Glasgow, insists asylum seekers are given as much help as the charity can manage, even once claims are at an end. “We do more than meet the Home Office contract,” he says. “All of the housing has to be of good standard – they are of a level I would be comfortable staying in. Connolly concedes that lumping so many asylum seekers in isolated areas such as Red Road or Sighthill was not the ideal dispersal policy – “it wouldn’t be the way you would design it now” – and believes a more sophisticated approach is already under way. According to a Glasgow City Council spokesman, the number of communities housing asylum seekers “is now closer to a dozen”. “There’ll be nothing on the same scale [as Red Road] in future,” says Connolly. “There are longer-term benefits for people if they’re integrated in a more dispersed way across the city. You do want a better mix. But one of the great ironies is that 33 Petershill Drive works. Although some of the consequences of placing large groups of newcomers in poor communities might have been predicted, other developments have been surprising and stirring. The Kingsway flats in Scotstounhill provided the stage for a dramatic local campaign to protect asylum seekers from the menace of dawn raids. Two Glasgow grannies – Noreen Real and Jean Donnachie – were so upset by the sight of screaming children taken away in their pyjamas that they set up an early-morning rota system to monitor Home Office vans driving into the estate. Following all the protests and vigils and pensioner-inspired trouble-making, the unpopular removal seizures stopped at Kingsway in 2007. As she reflects on the last decade inside Kingsway’s Wellbeing Centre, Noreen is phlegmatic about her achievement, grateful for the chance to welcome a whole new set of people into her life. “I don’t think in terms of asylum seekers or refugees,” she says. “They’re my neighbours and friends. When they came, it made the whole place vibrant again. Some of the young ones in the area would say things like, ‘Ma maw cannae get nothing off the social, and they’re getting everything’. Right on cue, Russian music producer Leo Saidenough walks in and gets a big hug from Noreen. Leo is jubilant after receiving leave to remain in the UK the week before, and now hopes to complete a degree in studio production at the University of the West of Scotland. Capturing “the magic of Abbey Road” is his dream. Will he and his wife Elena be happy to stay at Kingsway? Elie Harerimana arrived at the Kingsway flats from Rwanda in 2004 as a 13-year-old. He explains many fearful asylum-seeking parents didn’t want their kids to even go outside because of Home Office raids, and how he began to find friends with the Ignite theatre group – a project bringing young people together from nearby neighbourhoods. “There’s so many of these children getting on well in school and achieving things,” adds Jean, who looks back with some contentment at the changing face of her city.